We provide a complete service for the supply & installation of roof anchor points for any type of roof and/or structure. We have an expert team of certified height safety installers who are all approved by the manufacturers. We are approved installers for all major brand roof anchor points including Uniline, Safetylink, Capital Safety, Sayfa and many many more…. Roof anchor points are an integral part for anyone working at height, so we have certified installers with appropriate insurance. We are proud of having the approval of all major brands so we can provide you with custom designed systems with force management side by side with Uniline Safety Systems. For custom designed safety system, we provide unique service for systems for various industries, some examples are work areas at the top of trucks or buses in a warehouse environment, as well as for some structures needing specialised anchor for architects and/or engineer designers. We provide FREE advice for Architects and/or engineer designers for any of the manufacturers we hold approval for our installers. We also provide a unique roof anchor safety consultation. All our roofing are in full compliance with Australian Standards AS 1891.4 and AS 4488. We are in full compliance with our systems as well as having been approved by the manufacturers as part of the requirement of Australian Standards. All our installers also hold certifications in working at height and industrial rope access, so you can be assured that work is being done by the correct personnel in a company with the appropriate insurances and procedures. Call now for a free quote on 1300 789 474 or email the link in the top left bar…. Advanced Solutions Group’s Team understands the importance of safety as lives rely on the integrity of the installation of our system. 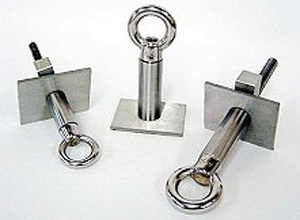 We follow strict rules in placing tested and certified anchors before use. All anchor point installations are provided with a certificate of installation in compliance with the Australian standards.